The 2019 Kia Sorento features the sort of attractive and practical style that you'd expect from a modern Kia. The exterior and the interior are both characterized by a balanced blend of style and ergonomics. The exterior of the new Sorento features touches like Kia's proprietary Solar Control glass that ensures just the right amount of natural light warms the interior of your new SUV. The interior of the new Sorento features standard accent illumination, which allows you to control the ambience in your new Kia. Automatic climate control is optional for optimal occupant comfort. See the stylish and versatile new Sorento at Southern Lynnhaven Kia today by taking a test drive. The 2019 Kia Sorento is a family SUV, and Kia understands the importance of keeping your family safe in all driving situations. The new Sorento is constructed from the ground up with tough materials to withstand a crash. The level of safety in the Sorento is further enhanced by a suite of standard driver aids like cutting-edge ABS, Traction Control and Electronic Stability Control. Test-drive the new Sorento at Southern Lynnhaven Kia today to experience the peace of mind that comes with a truly safe SUV. The 2019 Kia Sorento offers spirited performance in all driving situations. A peppy 185-horsepower 4-cylinder engine is standard. More adventurous drivers can go with the optional 290-horsepower V6 that offers impressive performance. All-wheel drive is optional for optimal grip on slick driving surfaces. Feel the performance of the new Sorento when you take a test drive at Southern Lynnhaven Kia today. The 2019 Kia Sorento is well-equipped with a wide array of advanced tech. The standard tech in the new Sorento includes Kia's UVO infotainment system with MP3 and SiriusXM® capability and 7-inch touchscreen display. Optional tech includes a Harman/Kardon® 10-speaker premium audio system for a top-notch music listening experience. 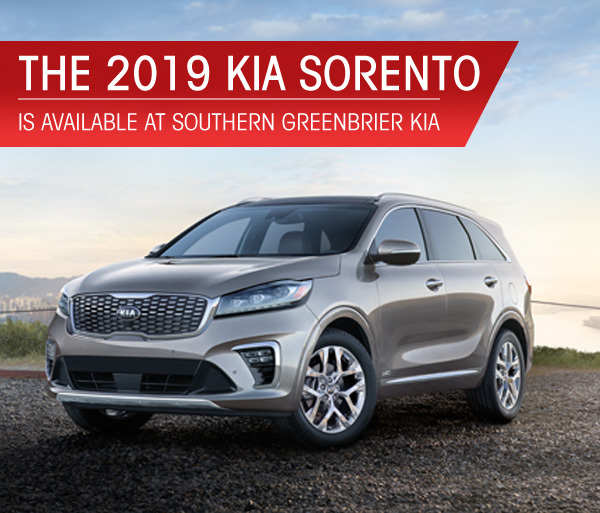 If you're in Virginia Beach, Portsmouth, Suffolk or Newport News, VA or Elizabeth City, NC, come into Southern Lynnhaven Kia today to test-drive the new Sorento.